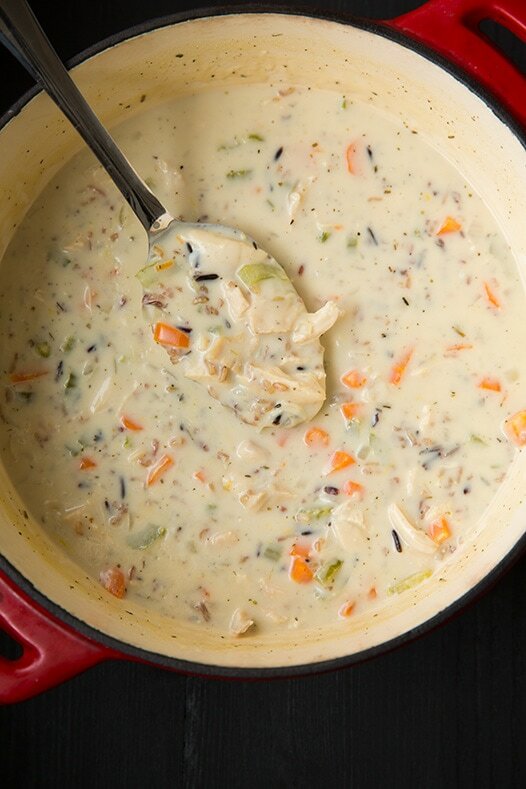 This Creamy Chicken and Wild Rice Soup is such a hearty and satisfying soup. It will quickly become a new favorite to add into your rotation. It’s like a chicken noodle soup made creamy with rice in place of noodles and I just can’t get enough! This soup is a new flavor to me. I’ve never made a wild rice soup so I figured it was about time. I chose to go with the creamy version because we all know a little cream makes nearly everything better, right? My husband said this soup was his new favorite soup! I love how the flavors are lightly similar to a creamy chicken noodle soup yet they are so unique. 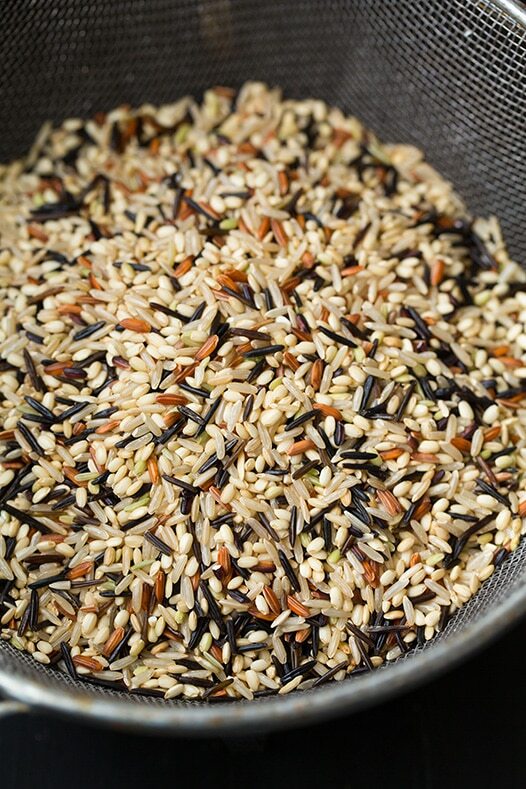 The wild rice blend offers something that pasta doesn’t. It has a light natural sweetness to it that pairs so well with the faint sweetness of the cream. I also love the texture the wild rice offers, it gives it a little bite rather than sinking your teeth into a mushy bowl of soup. 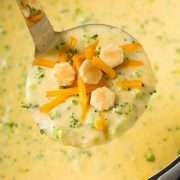 You’ll love the right flavor the lemon zest adds, it just gives this soup the added hint of flavor it needs. Besides, lemon and chicken just go together, right? So, how could I resist adding it? 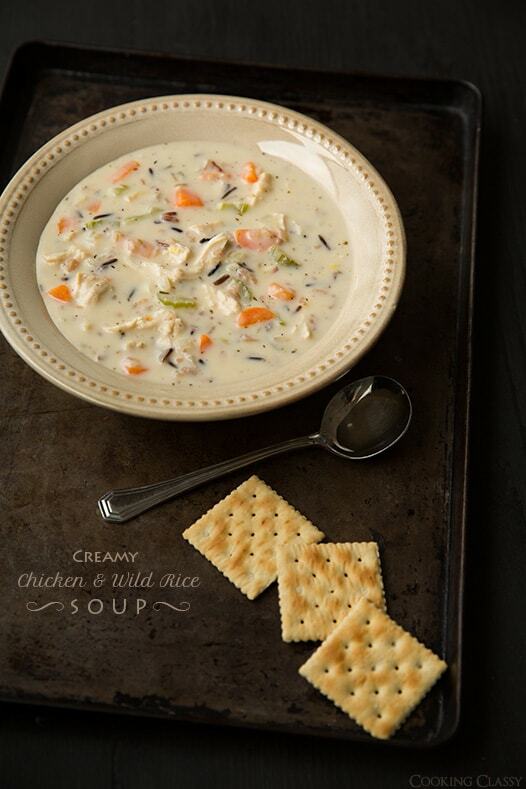 Make This Chicken And Wild Rice Soup Gluten Free! 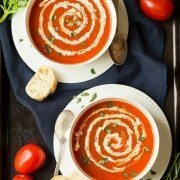 If you are looking to make this soup gluten free, it could probably be done by swapping out the flour for half the amount of cornstarch and blending it well with some of the milk instead (of course you wouldn’t be making a roux anymore but I’d still add in some of the butter for flavor and richness). Then check labels to ensure they are gluten free. Can You Freeze This Chicken and Rice Soup? Dairy doesn’t freeze well because it can split and curdle so I wouldn’t advise freezing it. You could store it in the fridge for 1-2 days but if the rice has been added it will absorb alot more liquid and could turn mushy. If you want to make this soup in advance follow all the steps but don’t cook or add the rice until serving. That way the textures will be just right! 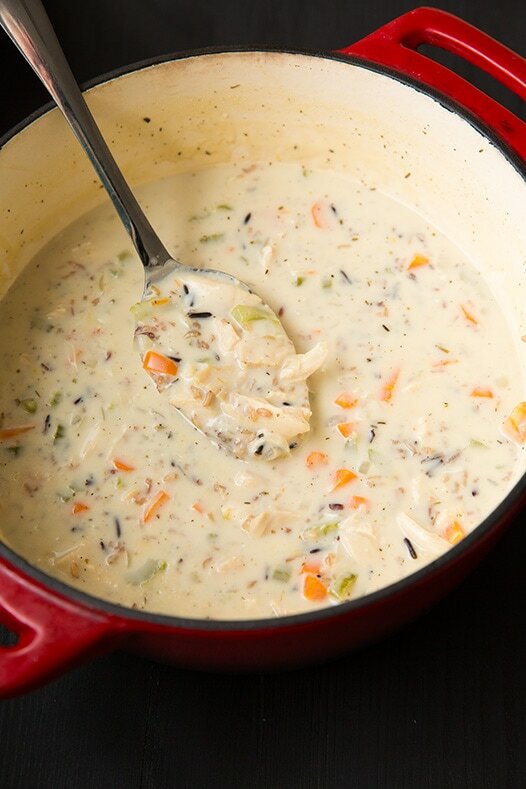 This Creamy Chicken and Wild Rice Soup is such a hearty and satisfying soup. It will quickly become a new favorite to add into your rotation. It's like a chicken noodle soup made creamy with rice in place of noodles. Halfway through the rice cooking, in a separate large pot, melt 1 Tbsp butter over medium heat. Add onion, carrots and celery and saute until slightly tender, about 4 minutes, adding in garlic during last 30 seconds of sauteing. Add chicken broth, thyme, marjoram, sage, rosemary and season with salt and black pepper to taste. Increase heat to medium-high, add chicken and bring mixture to a boil. Cover pot with lid and allow mixture to boil 12 - 15 minutes, or until chicken is cooked through (rotating chicken to opposite side once during cooking for thicker chicken breasts - if they don't fully immerse in broth). 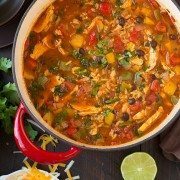 Remove chicken and set aside on cutting board to cool 5 minutes then shred into small bite size pieces. Meanwhile reduce heat to low and add cooked rice. Add shredded chicken to soup. In a separate medium saucepan (I just rinsed and wiped out the rice pan), melt remaining 6 Tbsp butter over medium heat. Add flour and cook 1 1/2 minutes, whisking constantly. Then, while whisking vigorously, slowly pour milk into butter/flour mixture. Cook mixture, stirring constantly until it thickens. Add milk mixture to soup mixture in pot and cook about 5 minutes longer, or until soup is thickened (at this point, you can simmer the soup for a longer period of time if you want the rice to soften more, just cover with lid first and stir occasionally. You can also add what's left in the remaining can of chicken broth). Stir in heavy cream and lemon zest and serve warm. *I used Lundberg Wild Blend Rice which I recommend for this recipe if you can find it.